Former president of Ireland Mary Robinson spoke frankly on her ideas for how Ireland should combat climate change on the inaugural episode of University College Cork’s podcast Plain Speaking, on March 27. In her discourse with program host Eoin Hahessy, Robinson covered a multitude of related issues facing Irish and global society, ranging from how to cut out the use of fossil fuels without destroying the livelihoods of workers in those industries to encouraging and making the most of activism in the younger generation of Irish citizens to reduce emissions and embrace alternative energy sources. Click here to hear the podcast in its entirety. Irish America magazine, the leading national glossy publication of Irish interest in North America, will host its annual Hall of Fame Awards luncheon on Thursday, March 14, at the Pierre Hotel in New York City. 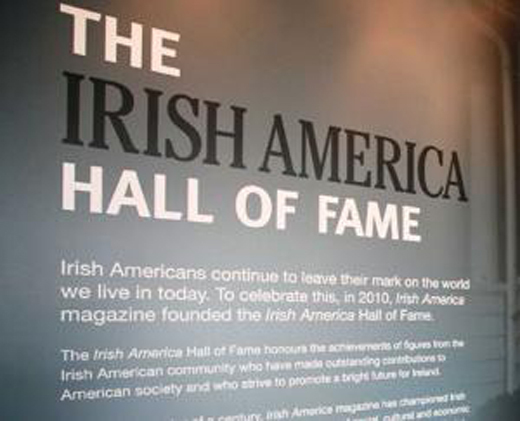 The Irish America Hall of Fame honors the extraordinary achievements of Irish-American leaders, from their significant accomplishments and contributions to American society to their personal commitment to safeguarding their Irish heritage and the betterment of Ireland. The Irish America Hall of Fame exhibition is housed in New Ross, County Wexford, at the Dunbrody Famine Ship Experience. This year’s inductees are NYPD Commissioner James O’Neill; legendary radio host Adrian Flannelly; Academy Award-winning director, screenwriter, and producer Terry George; the two co-founders of the award-winning Irish Repertory Theatre Company, Charlotte Moore and Ciarán O’Reilly; Grammy Award-winning Jazz musician Arturo O’Farrill and legendary lawyer and peacemaker John C. Dearie. The event will feature a cocktail reception followed by a seated luncheon and induction ceremony presented by Irish America founders Patricia Harty and Niall O’Dowd. The Hall of Fame inductees will each give remarks, and there will be performances by Arturo O’Farrill as well as Niamh Hyland and Shu Nakamura. Grammy Award-winning singer Judy Collins and Emmy Award-winning actress Fionnula Flanagan will be special guests. Irish America’s Hall of Fame, preserved at the Dunbrody in New Ross. Throughout the Irish-American community, John C. Dearie is recognized for having organized four Irish American Presidential Forums during Presidential election years. A lawyer of note, John was elected ten times to the New York State Assembly, and served as a State Assemblyman, representing his home borough of the Bronx. During his tenure, John was Chairman of the Committee on Cities, Ways and Means Committee, Housing Committee and Aging Committee, and was the sponsor or co-sponsor of countless legislation. James O’Neill is the 43rd Police Commissioner of New York City. A hands-on practitioner and dedicated police reformer, O’Neill was instrumental in developing the Neighborhood Policing strategy, which is renewing and recasting the NYPD’s patrol function to provide greater police and community interaction and collaboration. The program has now been implemented in all residential NYC precincts and is the largest, best-funded, and best-staffed community policing initiative ever undertaken in the United States. Adrian Flannelly is a radio broadcaster and host of The Adrian Flannelly Show since 1969. The first Irish-American talk radio show, The Adrian Flannelly Show continually presents a lively mix of interviews, music, culture and heritage, national and international news, and commentary. Flannelly serves as the Irish Cultural Liaison for the Irish Hunger Memorial in Battery Park City, adjacent to the World Trade Center and World Financial Center. In 2000, the Irish government appointed Flannelly as its U.S. Representative on its Task Force on “Policy Towards Emigrants.” He was appointed Irish Cultural Liaison to New York City Hall under Mayors Edward Koch and Michael Bloomberg. March 17, 1997 was declared “Adrian Flannelly Day” in New York City by Mayor Giuliani. Charlotte Moore and Ciarán O’Reilly co-founded the award-winning Irish Repertory Theatre in 1988 with a production of Sean O’Casey’s The Plough of the Stars. Today it is still the only year-round theatre company in New York City devoted exclusively to bringing Irish and Irish-American works to the stage. More than 40,000 audience members annually attend its productions. Moore acts as artistic director of the Theatre and has directed at least half of its shows, while O’Reilly acts as producing director. Arturo O’Farrill is a Grammy Award-winning jazz pianist, composer, and director of the Afro Latin Jazz Orchestra. His professional career began at age 19 performing with the Carla Bley Band at Carnegie Hall and continued as a solo performer with a wide spectrum of artists including Dizzy Gillespie, Lester Bowie, Wynton Marsalis, and Harry Belafonte. The son of Latin Jazz musician, arranger, and bandleader Chico O’Farrill, Arturo has performed in the U.S., Europe, Russia, Australia, and South America in just the last few years. He travels to Cuba regularly as an informal Cultural Ambassador, working with Cuban musicians, dancers, and students, bringing local musicians from Cuba to the US and American musicians to Cuba. 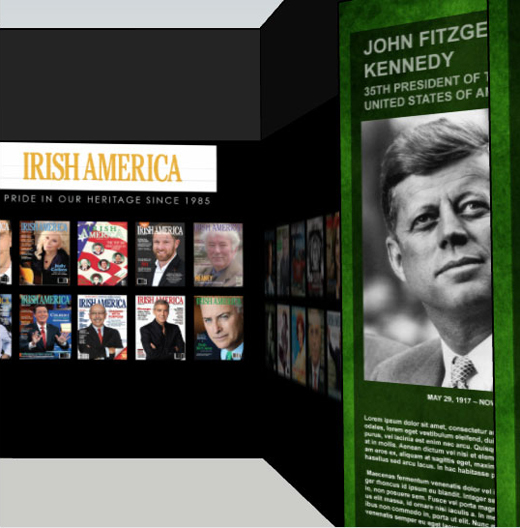 Visitors’ first introduction to the Irish America Hall of Fame. Since its inception in October 1985, Irish America has become a powerful vehicle for expression on a range of political, economic, social, and cultural themes that are of paramount importance to the Irish in the United States. It has helped re-establish the Irish ethnic identity in the U.S. (34.7 million according to the last U.S. census) and highlights the best political and business leaders, artists, writers, and community figures among the Irish in America. For questions about the event, please contact Mary Gallagher at mary@irishamerica.com. For information on the Hall of Fame, click here. On Wednesday, December 12, Irish America magazine hosted its 33rd annual Business 100 awards luncheon at the Metropolitan Club in New York City. The best and brightest Irish-American business leaders, representing some of the nation’s top corporations, were honored, and Eileen McDonnell, the chairman & CEO of Penn Mutual, served as the keynote speaker. Coming in from all over the country, and representing a range of generations from 4th- to Irish-born, the impressive group of honorees, 57 of whom were in attendance, included such notables as Don Colleran, chief sales officer at FedEx; Gerry Cuddy, the CEO of Beneficial Bank; John Saunders, the president and CEO of FleishmanHillard; and Kevin McManus, Andrew O’Flaherty and Ted Sullivan, all high-level executives at SAP. The occasion was also an opportunity to highlight the women on the Business 100 list, who, like the keynote speaker Eileen McDonnell, have broken through the corporate glass ceiling. These included Audrey Hendley, the Irish-born president of American Express Travel, one of the largest multi-channel consumer travel agencies in the world; Michele Cusack, a first-generation Irish American who is Chief Financial Officer of Northwell, one of the largest health systems in the United States; and Julie Davis, a private wealth advisor at Goldman Sachs, who is 4th-generation. Julia credits her persistence and love for finance to the spirit of her grandfather, who taught her that you can never give up on yourself. Paying tribute to the ancestors is an important part of Irish America’s events, and the co-founders of the magazine, now in its 34th year, Niall O’Dowd and Patricia Harty, emphasized this in their opening remarks. “You help us honor our past and celebrate our future,” said Harty, welcoming “old friends and supporters, and the many new faces” to the luncheon. The Consul General of Ireland in New York, Ciarán Madden, also welcomed the honorees and focused his remarks on the special relationship between Ireland and America that goes back many generations. The true highlight of the gathering was Eileen McDonnell’s touching keynote address. McDonnell, who is the subject of the cover story in the January / February 2019 issue of Irish America magazine, paid homage to her four grandparents who emigrated from Ireland so that she could one day have a better life. She spoke of her father’s father, Terence McDonnell, who grew up on a dairy farm in the west of Ireland, but, upon arriving in New York City, had to reinvent himself. He went to work in a grocery store, and rose to become manager of an A&P store, and moonlighted as a bartender in Richmond Hill, Queens, setting an example of how “adaptability and relationship skills are transferable and oftentimes even more valuable than technical abilities,” as McDonnell recollected. She also highlighted the accomplishments of the other honorees in the room, noting that they all have their own stories of brave ancestors who left everything behind so that their descendants could one day sit in that room. 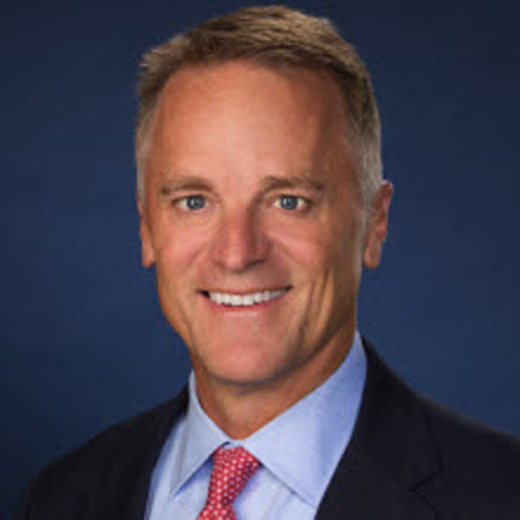 “Great leaders recognize that success is based on the success of others, and that they are a part of something bigger than themselves,” said McDonnell. McDonnell received a standing ovation. As did Niamh Hyland, from County Leitrim, who, accompanied by Sku Namamura on guitar, provided the entertainment. We Irish really do have a lot to proud of, and it’s not all about who is voting for who but rather who cares deeply and gives back. Irish America’s honorees set a wonderful example. Irish America magazine is delighted to announce that Eileen McDonnell, Chairman and CEO of Penn Mutual will deliver the keynote address at the 2018 Business 100. Please join us on December 12th at the New York Metropolitan Club, to celebrate Eileen and the 2018 Business 100 honorees for the 33rd annual awards luncheon. To nominate a candidate to our list, please. email mary@irishamerica.com. About our Keynote: Eileen McDonnell is Chairman and Chief Executive Officer at the Penn Mutual Life Insurance Company. She is a graduate of Molloy College and went on to complete her M.B.A. in finance and investments at Adelphi University. She received an honorary doctorate from Molloy College in 2011. In 2017, Eileen was the recipient of the Ernst & Young Entrepreneur of the Year Award for the greater Philadelphia region. Eileen is a native New Yorker and is a second-generation Irish American with ancestry from counties Clare, Leitrim, Mayo, and Sligo. She takes inspiration from her grandparents, whose courage and optimism embodied the spirit of the Irish she’s proud to have inherited. Eileen belongs to a number of organizations, including the Irish American Business Chamber and Network. She has also been honored as one of Crain’s New York Business 40 under 40. Eileen has also been awarded the honor of being inducted into the Business Excellence Institute Hall of Fame in Dublin. To see complete coverage of last year’s 2017 awards and Keynote Speaker Bill McDermott CEO of SAP, please click here. Past honorees include Michael Dowling, CEO of Northwell Health; two Nobel Prize winners, Dr. James Watson and William C. Campbell; as well as Dr. Barbara Murphy, Chair of the Department of Medicine for the Mount Sinai Health System. To read the entirety of Eileen Murray’s featured interview in the September / October 2018 issue, click here. Note: Those looking to take Tom’s and Father Finucane’s advice may follow this link to Concern Worldwide’s website. A contribution to the organization he loved and worked so hard for would be a great way to honor Tom’s memory.